Press deep dents into the middle of the balls with the back of a small teaspoon, wetting the spoon if the dough starts to stick – I thought it was easier to do that with my index fingertip. Fill each of the indents with ½ teaspoon of jam and bake for 10-15 minutes or until golden. Let cool in sheets for 5 minutes then transfer to a wire rack. I'm going to keep these in mind when I need to use up jam! Very cool looking recipe. I think I would like to try this with all sorts of jams. I have some ginger marmalade in the fridge. This would be the perfect ingredient. Pam, I hope you give these a try! Satya, thank you for stopping by! Lindsay, thank you! Hope you like the recipe! Josh, I'll take a look. Tks! Mark, thank you for stopping by! That marmalade sounds divine - I love ginger! Torview Toronto, thank you for stopping by! Such a smart idea! 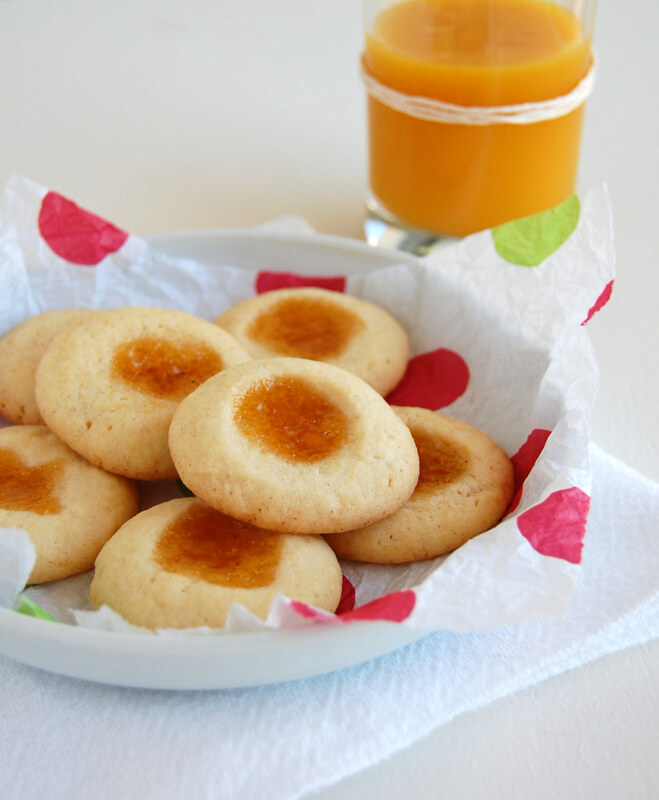 I'm going to make these to use up the leftover apricot jam in my fridge too. Yum! These cookies have been dubbed "sunny-side up" cookies in my circles! They're delicious! Sarah, thank you! I hope you like them!